Chen Qiufan (Chinese: 陈楸帆; born 1981), also known as Stanley Chan, is a Chinese science fiction writer, columnist, and scriptwriter. His first novel was The Waste Tide, which "combines realism with allegory to present the hybridity of humans and machines". Chen Qiufan's short fiction works have won three Galaxy Awards for Chinese Science Fiction, twelve Nebula Awards for Science Fiction and Fantasy in Chinese. The Fish of Lijiang received best short form award for 2012 Science Fiction & Fantasy Translation Awards.His stories have been published in Fantasy & Science Fiction, MIT Technology Review,Clarkesworld, Year's Best SF, Interzone,Lightspeed, as well as influential Chinese Sci-Fi magazine Science Fiction World. His works have been translated into German, French, Finnish, Korean, Czech, Italian, Japanese and Polish and other dozens of languages. Chen was born in Shantou, Guangdong, China in 1981. 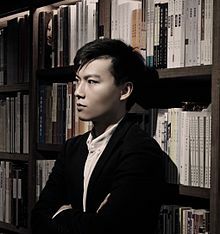 He graduated from Peking University with dual bachelor's degrees in literature and fine arts, and pursued graduate studies in the Integrated Marketing Communications (IMC) program of Hong Kong University and Tsinghua University. He later worked for Baidu and Google China. ^ a b Liu, Ken (2016). Invisible Planets: Contemporary Chinese Science Fiction in Translation. Tom Doherty Associates. pp. 19–20. ISBN 978-0-7653-8418-8. ^ a b Feng, Emily (2018-04-19). "Chinese cult writer Chen Qiufan on pushing the boundaries of sci-fi". Financial Times. Retrieved 2019-02-06. ^ Li, Shiyu (2018-04-16). "Author Chen Qiufan on cyberpunk, realism and Chinese sci-fi". China Radio International. Retrieved 2019-02-06. ^ Rojas, Carlos; Bachner, Andrea (2016). The Oxford Handbook of Modern Chinese Literatures. Oxford University Press. p. 559. ISBN 978-0-19-938332-0. ^ Xu, Xiao (2018-10-28). "陈楸帆：科幻不只是小说". China Writers' Association. Retrieved 2019-02-06. This article about a Chinese writer or poet is a stub. You can help Wikipedia by expanding it. This page was last edited on 10 March 2019, at 08:26 (UTC).